Nato has urged Russia to end air strikes "on the Syrian opposition and civilians", days after Moscow began raids to support Syria's government. Moscow says it is targeting Islamic State and other Islamist positions, but US-led allies and Turkey say government opponents are targeted. Turkish F-16 fighter jets were scrambled after a Russian plane entered Turkey's air space on Saturday. Russia said the violation was for just a few seconds and due to poor weather. Saturday's interception took place near Yayladagi in the southern Hatay region, Turkey says. The foreign ministry in Ankara said it had summoned the Russian ambassador to issue a "strong protest". Turkish jets patrolling the border were also "harassed" by an unidentified plane on Sunday, Turkey said. A statement by Nato's 28 members, that include Turkey, warned of "the extreme danger of such irresponsible behaviour" and urged Russia "to cease and desist". US Secretary of State John Kerry said Turkey would have been within its rights to shoot the jets down. "The Turkish Armed Forces are clearly instructed," Turkish Prime Minister Ahmet Davutoglu told Turkish TV. "Even if it is a flying bird, it will be intercepted." But he played down the possibility of a "Turkey-Russia crisis", saying that channels between the two countries remained open. The Russian air campaign began on Wednesday, with Moscow saying it was targeting IS positions and those of other Islamist groups. Syria said on Monday that the air strikes had been planned for months. Mr Putin has denied that civilians have been killed in the past week, but evidence on the ground has indicated otherwise. Turkey and other members of the US-led coalition in Syria say the principal target is in fact the Syrian opposition groups fighting President Assad. Nato said Russian air strikes did not target IS positions, but said it should "focus its efforts" on doing so. Moscow has not responded to Nato's comments. But earlier on Monday, Vladimir Komoyedov, the head of the Russian government's defence committee, said Russia had not ruled out attacking rebel positions using warships. The RIA Novosti agency quoted him as saying ships were "prepared" but that an imminent assault was unlikely as rebels were too far inland. Interfax reports (in Russian) that two more Russian military ships are on their way to the eastern Mediterranean. The Russian incursion into Turkish air space has set alarm bells ringing in Nato with Alliance ambassadors describing it as "irresponsible behaviour". The US Secretary of State John Kerry has also expressed his concern, noting that this is "precisely the kind of thing" Washington warned about in pressing Russia for talks to avoid mid-air incidents. Turkish jets shot down a Syrian Mig-fighter in March of last year. 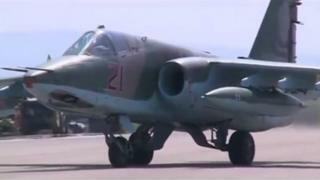 Another Syrian aircraft, possibly a helicopter, was shot down last May. Nato has called on Russia to "take all necessary measures" to ensure that such violations do not take place in the future. American sources claim that, far from being an accident, the Russian pilots knew exactly what they were doing. As the Russian air campaign moves into a higher gear, this episode illustrates some of the wider dangers involved.